Last year's contest was fun, so lets do it again. This years deadline for entries will be November 29, 2009. Other rules remain the same as stated below. Here are the entries from the 2008 contest. On my Yahoo Group we are having a contest. 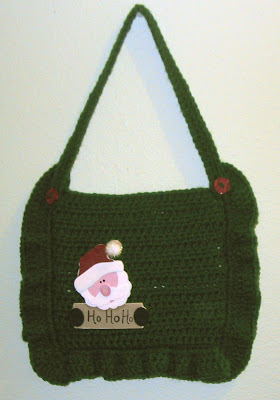 Crochet the Christmas Card Pouch, embellish it and post a photo, in the CHRISTMAS CARD POUCH ALBUM. 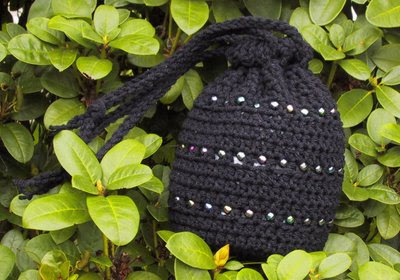 We will then have a poll to select a favorite, that crocheter will receive a prize. I haven’t decided what the prize will be but it will be something fun. The deadline for submitting photos will be November 30, 2008. The poll will run from December 1-10. The prize will be mailed out in time for Christmas arrival. Crocheters from outside the USA are eligible as well. Hang on the wall, a hook or from a doorknob. It is quick to crochet in worsted weight yarn. Embellish as you desire. The one in the photo has a wood and felt Santa from Michaels. 2. Bag is worked in a front and back section. Then the front and back are joined by single crocheting around three sides. The ruffle is crocheted working in the sc used to join the front and back. 3. Photo shows bag using RHSS Paddy Green looks more like Hunter. 4. Embellishments, I used buttons and a wood and felt Santa. Fasten off first piece, on second piece don’t fasten off. Starting at upper corner with the front and back held wrong sides together, working through both layers, ch 1, sc down side, 3 sc in the corner, sc across bottom, 3 sc in corner and sc up the other side. Work approximately 24 sc on each side. ROW 1: Ch 2, turn, *2 dc in each st to corner, 3 dc in each of the 3 corner sts, 2 dc in each st across bottom, 3 dc in each of the 3 corner sts, 2 dc in each st up other side. ROW 2: Ch 2, turn, *dc in each st to 9 corner sts, 2 dc in each of 9 corner sts, dc in each st across bottom, 2 dc in each of the 9 corner sts, dc up other side. Fasten off. Row 2: Ch 1, turn, sc in each sc. Row 3: Ch 1, turn, slipstitch in each sc. Fasten off leaving an 8 inch tail. Using the tails on the handle and bag, sew the handle to the front of bag. 2. At end of pattern read instructions on alternative method of working round 12, using hdc bead stitch. Hdc bead stitch makes the beads sit on top of the work. Bag in the photo is worked in the original method. Before beginning string 72 pony beads on yarn of your choice. I always sting on a few extra, just in case I mess up on my stitch count and need another bead or two. Round 24: Ch 1, sc in same stitch as join and each hdc around. Join with a slip stitch in first sc. Round 25: Ch 1, sc in same st, ch 3, (skip 1 sc, sc in next sc, ch 3) around, ending ch 1, hdc in top of first sc. Round 26: Ch 1, sc in loop formed by hdc, *sc in next sc, 3 sc in ch 3 loop, repeat from * around. Ending with sc in sc, 2 sc in loop. Join with slip stitch in first sc. Ch 85, (for longer handles makes a longer chain) slip stitch in 2nd ch from hook and in each ch back to beginning. Fasten off weave in ends. Weave drawstring through spaces made by round 25, tie ends together with an over hand knot. Make second draw string. Weave second drawstring through spaces starting on opposite side. Tie ends together with an overhand knot.